Who Has the Best Aurora Doors? Aurora, IL is one of the largest suburbs of Chicago with a population of 197,899 residents. Having a lot of people means there are many houses as well. As these homes get older, the doors in Aurora will need to be replaced. Having high quality doors in Aurora is extremely important. They must be energy efficient, durable and customizable. It’s also important to make sure the installation of your replacement doors is done correctly too. That might seem like a lot to keep track of but don’t worry. 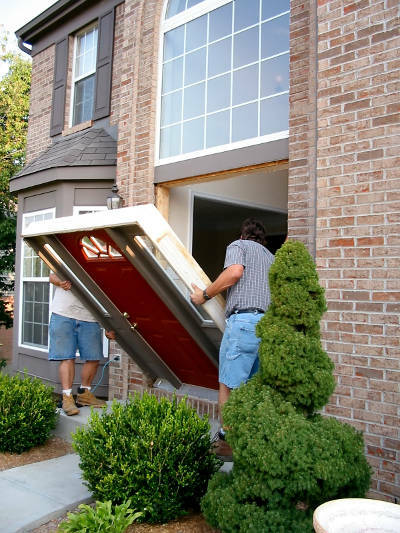 We’ll make sure you have all the information you need about doors in Aurora, IL. Let’s get started. Before you can start getting into the technical aspects of Aurora doors, you need to know what type of door you want. There are several different types you can choose from – entry doors, patio doors and storm doors. We’ll go over each style in greater detail below. 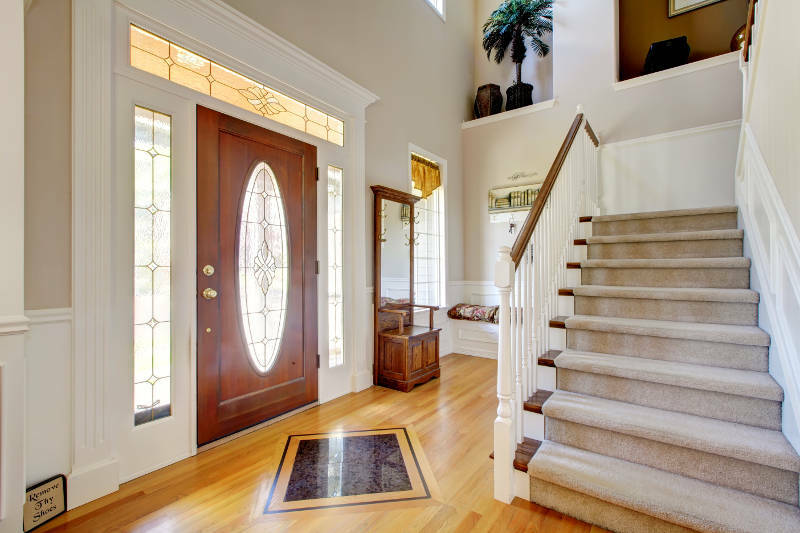 Entry doors are typically your front or side doors. Since they usually face the most foot traffic, they need to be sturdy and durable. Also, since your entry door is most likely in the front of your home, it needs to make a great first impression. You want a replacement entry door that gives you many customization options so you can create your dream door. Aurora’s weather patterns can be unpredictable. It can be warm one week and freezing the next. You’ll want an entry door that can protect you from the outside temperatures and keep your home comfortable year round. Did we mention that replacement doors will save money on your energy bills too? 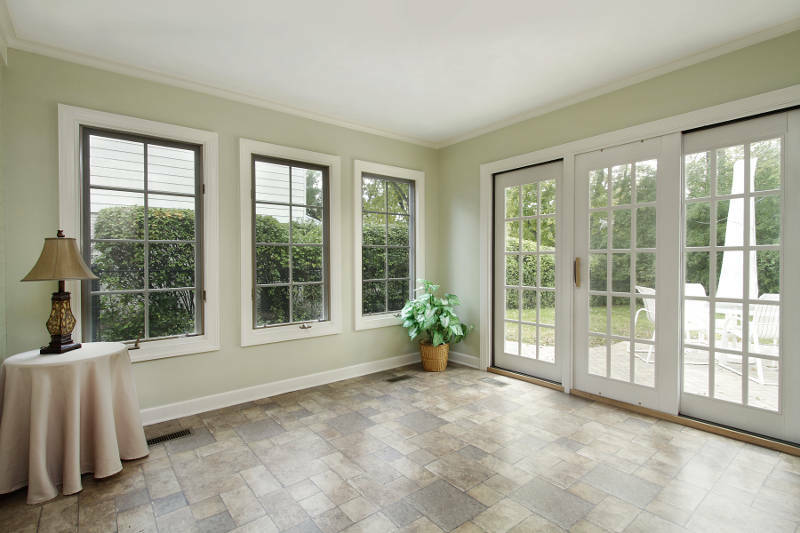 Patio doors are doors that open up to a patio, backyard, deck or sunroom. There are two different styles available – swinging patio doors and sliding patio doors. Swinging patio doors, also known as French patio doors, swing open on a hinge. You can use most entry door styles for your swinging patio doors. There are two or three panel options available and you can customize the direction in which your door swings open – inwards or outwards. There’s nothing more elegant than a beautiful French patio doors. They’re sure to draw a lot of attention and will add beauty to your home both inside and out. Sliding patio doors open left and right on a sliding track. This is perfect for homeowners of all ages because of how easily they open. Think of sliding patio doors like sliding windows – they’re made of a large framed pane of glass on a sliding track. Because of this, you’ll need much less space to fit a sliding patio door in your home. You won’t have to rearrange your furniture to compensate for doors that swing open. 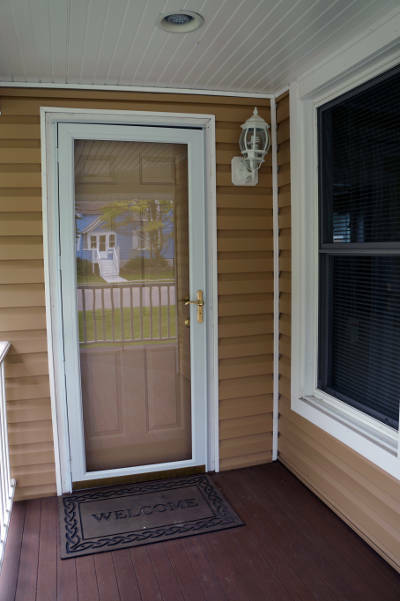 Aluminum storm doors will help improve the energy efficiency of your home in Aurora. This is because they’re installed between your entry door and the outside. Not only will this protect your door from rain, snow, hail and heavy wind, but your home will be more energy efficient too. You’re adding another layer of insulation to trap heat inside while keeping cold weather outside. There are many different screen and color styles for your door such as retractable screens, half-glass and full-glass options. There are also metal mesh screens which are perfect for homes with small children or pets. As you already know, it’s important to have an energy efficient door in Aurora so you can make your home more comfortable year round. Plus, you’ll end up saving money on your energy bills. Let’s look at what makes a energy efficient door. 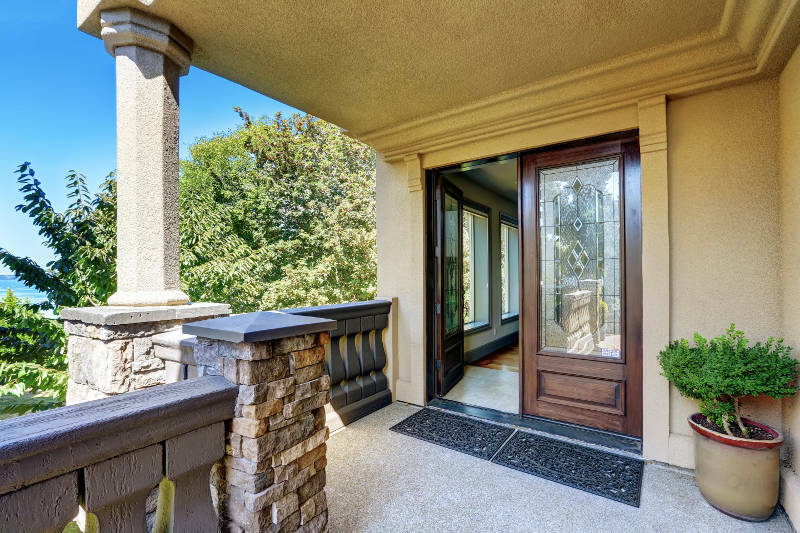 For an entry door, we recommend either fiberglass or steel doors. This is because they’re constructed with a foam core that helps prevent heat from escaping your home. They’re the perfect entry door options for your Aurora home. Patio doors are a little bit different. While swinging patio doors are essentially entry doors, sliding patio doors are constructed mostly of glass. We recommend treating them like large windows and going with vinyl sliding patio doors for your home. They have double or triple pane, argon gas-filled glass and foam insulated frames. No drafts will be getting into your home. Adding a storm door to your entry doors will help improve the energy efficiency of your home as well. Combine that with a steel or fiberglass entry door and you’re golden! Living in Aurora, your replacement doors have to be able to handle the elements. Whether it’s rain, snow, hail or wind, your door shouldn’t have any problems. Wood doors, on the other hand, begin to warp, rot, swell and expand when exposed to moisture. Moisture is something your door is going to experience while living in Aurora. Vinyl, steel and fiberglass doors are all resistant to moisture problems. Part of getting replacement doors in Aurora is finding something that matches your style. You don’t want to choose from a few cookie-cutter door designs. You want to be able to change the color and hardware of your replacement doors and customize them to your liking. There are also sidelight, transom and decorative glass options that can be added to your replacement doors in Aurora. Not only will this allow more light into your home but they’ll also improve your home’s curb appeal. In order to enjoy all of the benefits your replacement doors have to offer, you have to find the best door company in Aurora. You might be asking yourself, “What makes a door company the best?” We have a couple of qualities to look for in a door company below. Installation is key to your Aurora doors. If they’re not installed properly, your doors won’t be energy efficient, durable or sturdy. Plus, they’ll look bad! Make sure you find a door company that pays attention to detail and will complete your door installation quickly and efficiently. The longer a door company has been in existence, the more you can trust them. This means they have experience that the fly-by-night door companies won’t and they’ve satisfied many homeowners. If customers weren’t consistently happy with them, they won’t continue to be in business. It’s also important to note that a company that has existed for a long time will be around to support you through your replacement doors’ life. If a problem ever arises, they’ll be there to help you. Look for a company that has been in business for a minimum of 10 years – the older, the better. It’s important to get the best doors for your home. You want replacement doors that are energy efficient, durable, sturdy and customizable. Finding a door company that offers great installation on top of premium products is a must. If you’re looking for a door company in Aurora that provides a high quality product with expert installation, your best bet is Feldco. For 40 years we’ve served over 350,000 happy customers. That’s not something most companies are able to say. If you need replacement Aurora doors, get a free quote from Feldco now and see what all of the fuss is about. You won’t regret it.